Wexford 6-pc. Counter-Height Dining Set w/ Bench When family and friends gather, X marks the spot with the Wexford 6-piece dining set. From the X-back design of the stools and bench to the 2-tone inlaid pattern on the tabletop, the crisscross motif plays out in hickory veneers finished in mellow brown and warm oak. Upholstered seating in linen-blend fabrics and hardwood frame construction are details that enhance every gathering. When family and friends gather, X marks the spot with the Wexford 6-piece dining set. From the X-back design of the stools and bench to the 2-tone inlaid pattern on the tabletop, the crisscross motif plays out in hickory veneers finished in mellow brown and warm oak. Upholstered seating in linen-blend fabrics and hardwood frame construction are details that enhance every gathering. L: 72" x W: 36" x H: 36.5"
I love this set!!! When I was considering a table I chose this because I can use it as a smaller table or expand it for family dinners. It is great that the leaf fits right inside the table so you don't have to worry about where to store it. It is comfortable to sit on an beautiful to look at. We were looking for a pub-height dining room set nice enough for formal dining yet comfortable for casual everyday use. 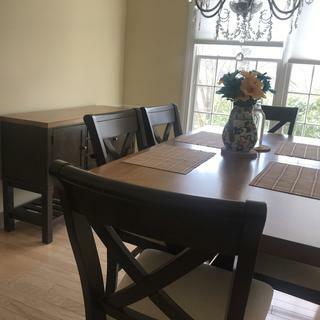 We added 2 extra stools for kitchen island so we have seating for 8 when needed. Well made, excellent materials. Firm, comfortable seating. The bench has become my favorite place to enjoy a cup of coffee. Simple design , elegant look . Beautiful set, at a fair price. Comes with a removable leaf, that is stored inside the table for convienance. The table, chairs and bench are solid and sturdy. Perfect for either two people or eight people. It was Love at first site! When my husband and I walked into the showroom and saw this table we fell in Love! The two seater bench is a great compliment to this set. Not only do you get the bench but you also get four chairs. The wooden table top design is so pretty that I went out and bought clear vinyl material to cover the top so people can see the design instead of covering it up with a table cloth! This table is horrible. After the first week it started peeling and I asked to have it replaced. After several phone calls with multiple people they agreed to replace it. I received a new table and after several weeks it was peeling again. The table is very sturdy, but that's about it. Don't dare put your dinner plate on it if it's hot because it will create a giant white spot that takes some time to get out. The cushions on the chairs do not clean up nicely either. I have scrubbed them over and over and it leaves a bigger stain. I don't ever write reviews but I was so disappointed in this product. Looks great in out morning room! beautiful set. sturdy and well constructed. unique piece, nice blend of modern/traditional. table top color is lighter than looks in picture. We got it at the Labor Day sale and couldn't be happier. I sit in the bench seat nearly everyday to work. My parents, who are older with several health issues also loved the height of the chairs. This set is really sturdy too. Love it. The moment my husband and I saw this set we knew it was perfect .We actually had another set in mind at a different location and said we were just looking to match prices when we fell in love with this... It goes perfect in our country home, we purchased the bench with 6 chairs. Couldn't be happier. Fell in love with this set in the showroom,got it home and it looked awesome in my sunroom. Upon using our "dining" table we noticed that it not only leaves white marks where any moisture has been but also starts to peel and warp. very disappointed!! Also the chairs do not clean up well, any stain will continue to grow as you attempt to clean. we now have towels on all the chairs. We bought the Wexford and the matching server for our kitchen. It is a beautiful finish to our kitchen - nicely coordinated with our counters & cabinets. Delivery guys were quick and courteous. As a family, we keep coming back to Raymour & Flanigan. Beautiful and good looking dining table set. It is very sturdy and worth the price. It looks very modern and has a unique feel to it. Very different from the regular dining table sets. Have had my eye on this set for a long time. Looks so nice in my space! Chairs are nice and comfy!! 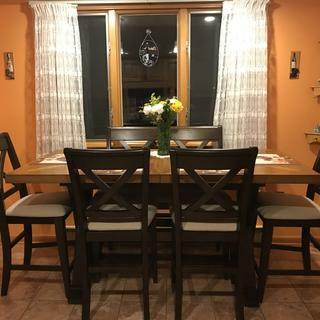 Sturdy counter height dining set, different than all the rest. Many compliments. Looks like it will last forever. Certainly worth a look 3.5 x 6 ft w/o the leaf. 90" with leaf, that is self storing. Cant wait for thanksgiving. Will seat 10 or 12. Have 6 chairs and a double. Had a difficult time finding a table that fit in the space that was available. This table was perfect. Mission Accomplished! Compliments our new kitchen. ?? Love my new dining room set. It’s solid and looks beautiful! I wanted a Countertop dining table. I spent hours online looking at many different stores. I went to Raymour with another table in mind. I saw this one and made a beeline to it. I loved the design and the size. I was not looking for a square table and this fit my needs. The inside storage of the leaf is a great idea. I swapped out the bench for two chairs instead, increased my price but I did not see a bench something that my family would use. The color of the table and chairs in the showroom is not the same as the online pictures OR the brochure. I was nervous on how it would look in my kitchen with all of the natural light but it looks great. Raymour delivery was quick and my 1st visit to the store was a nice experience, would definitely go back here to shop. The Wexford is a great quality dining set. Very glad we purchased it. Love the bench & chairs. Very sturdy and comfortable. convenient fit for any medium sized dining room and will not interfere with chandlier. I am in love with my dinning room. The chairs are very comfortable as well as the bench. It's really beautiful. I am so happy with my bought. The table is very comfortable... looks amazing. We did get covers as the cushions are light colored. Love our new table set! I replaced a 42" round table for this beautiful set. My problems was family holidays.... believe it or not, this works out better as far as space. Everyone loves it ! Love Raymour and Flanigan. The delivery guys are gerat. Very professional and careful. Won't shop anywhere else. Thank you ! Our new dining room set is so impressive. We did not realize how big the table was without the extra piece. Chairs are comfortable. The color of the wood is very rich. This dining set is BEAUTIFUL! I LOVE it! Can't express enough just how beautiful it looks and feels...so happy with this purchase! The size of this table is perfect for my small house. It is long and narrow, does not take up as much width as my other tables, but provides just as much room for everyone to fit comfortably. Purcased more than a year ago. Looks beautiful. Very functional. I love this set! The chairs are sturdy and storing the leaf is so easy. I love the mix of light wood and dark wood which pulls in all the other furniture in my home. The height is great and there is plenty of space length wise. Love that the leaf is self stored. I do wish the table was a bit wider. But it works well for our family. Received my table 3-5 days after purchase. Delivery was fast and set up was quick, the guys were professional. Table and chairs went perfect with our living room set . Looks better at home then at the store. Will continue to get my furniture from RnF . Hello Marianne, we're very sorry to hear about this experience and would like to look into this for you. Your order details, contact information and a copy of your concerns have been forwarded to our customer care team so we can better assist. Thank you for your review, we always appreciate feedback on our products! I feel the need to write a review of this product after owning it for over a year. I have 4 kids and knew buying a table that had fabric seat cushions was a risk. Because of that, I was convinced at the R&F store to purchase the platinum protection and they can get out any stain or replace it. So I did that. Well, these cushion stain with a simple drop of water. There is no way to get water stains out of the seats. I have had 4 techs come here from Platinum protection and they all tell me the same thing - there is NO WAY to clean the cushions. What are you options? We will send you brand new cushions, that we already know will stain, and you lose your platinum protection on the cushions since they have now been replaced. So in the end you are stuck with stained cushions that will continue to stain and there is no way to fix it unless you want to replace them with more of the same cushions that will also stain and will no longer be replaced because your platinum protection is now gone. Thanks R&F for selling a terrible product that you can't guarantee. Called customer service on 12/4/16 to report that the finish was coming off table. Was told that since I purchased on 11/13/15 that there was nothing they could do warranty wise but would happily send tech out for a fee. Nice table but not worth the $$ if finish is already coming off. Would think that table would hold up for longer than a year. Will hire private party to repair. Bought this set for my kitchen and love it. However, you can't leave anything with moisture for more then 20min. For, a table that is used to eat on this shouldn't happen. That's why it's a dining/kitchen table. My table does have peeling and a ring mark on it from a cup. Had a technician come out to determine it can't be fix. Called the protection plan and they said my option was to replace table and the lose protection plan or switch out for another set and lose protection and pay a restocking fee on chairs since there is nothing wrong with them. So basically I'm screwed either way. There is a major defect with this table, it shouldn't peel if you leave a cup. I'm so disappointed in Raymour , they should really stand by their products. where do you store the leaf? Is there storage withing the table? BEST ANSWER: The Wexford Dining Table includes a 24" extension leaf. We would recommend using a Dining Table Leaf Storage Bag to cover and place the leaf in an area where storage is horizontal, such as under a sofa or bed. Does the wexford come in regular height not counter height ? BEST ANSWER: Although the Wexford does not offer a non counter-height table in their collection, the Bryce Canyon dining table might be considered, as it is a similar style and available in the lower height. Cannot open table to insert leaf? There are two latches underneath the table that need to be released first. Im going to purchase this set but I cvant find the serving table shown in the picture, can you tell me what sku it is or brand? BEST ANSWER: Hello Chrissy, thank you for your interest in the Wexford collection! We no longer carry the Wexford Server, however it may be available to special order directly from the manufacturer. Our SKU# for the server is 770312836. Please visit you local showroom or please contact our online sales department at 866.383.4484, option 2. We would be happy to assist you! can I get this marble table in another color? BEST ANSWER: This dining set does not come in any other colors. 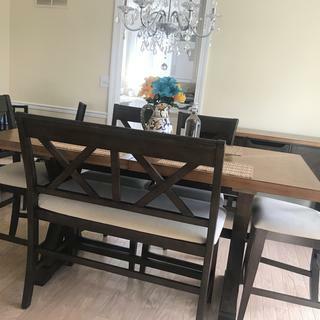 Also, there is no marble in this dining set, it is actually made of a hardwood frame with a hickory veneer on the inlaid pattern on the tabletop. Is there a table protector that goes best for this table? BEST ANSWER: For assistance in getting a table protector, please call 866-383-4484 option 2. BEST ANSWER: The Wexford dining table weighs 163 pounds. Are the seats stain resistant? How is the table delivered? In 1 piece or multiple pieces? Will it fit thru a standard size front door for delivery? BEST ANSWER: Raymour & Flanigan provides a White Glove Delivery service. The table will fit through a standard front door. The delivery team will make the determination as to whether the table would require final assembly in your home due to their size or configuration. hi, what does the 5 piece set consist of? BEST ANSWER: The Wexford collection is available in only the upholstery option as shown. Does the seat cushions come in a different color? BEST ANSWER: The seat cushions are not offered in a different color.